Recently built home located within the most luxurious gated community in the Central Valley area of Costa Rica. This residential features 24/7 Security, Country Club with Olympic Size swimming pool as well as Tennis courts. They are building a brand new highway which will make drive time from your house to the tropical beaches at the Pacific only 30 minutes. The property measures 1284 M2 / 13,800 sq ft. and features a living area of approximately 750 M2 / 8,070 sq ft. The house comes with 7 bedrooms all with full Bath and extra a full maids quarters. Very spacious garage with extra parking space outside. Large pool including spectacular waterfall. The house is equipped with its own elevator. Full A.C. throughout. Special attention to details and the finest high quality fixtures and fittings throughout the mansion. This mansions is a spacious family home with lots of room and privacy for everyone. Property is situated on a excellent lot with views direct to the Pacific. Every day you can enjoy sunsets views from the numerous balconies on the estate. This is a must be viewed property to be able to appreciate all its quality. There is a adjacent vacant lot available next door. 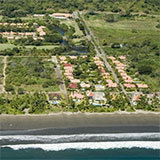 Feel free to contact our real estate office in Costa Rica. Viewing is possible to qualified buyers by appointment only.